The heads of the Securities Exchange Commission and the Commodity Futures Trading Commission sat before a congressional committee this morning to restate their intent to regulate—but not stifle—cryptocurrency and its related offerings. During questioning, however, it became clear that foundational issues are stalling progress in cracking down on fraudsters. 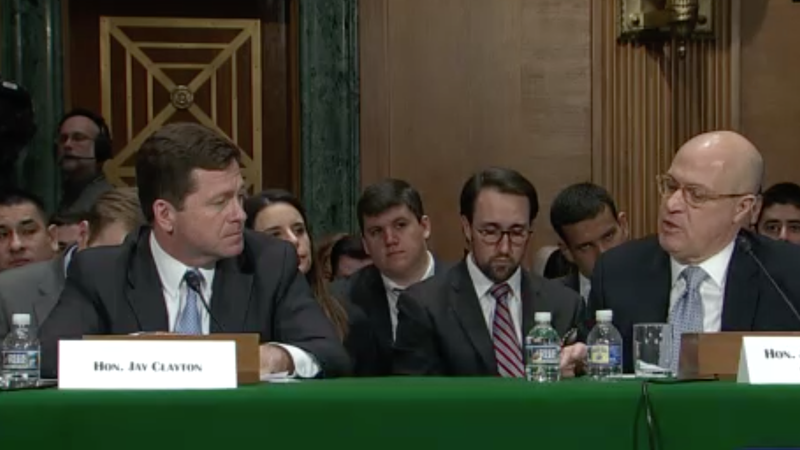 Following opening remarks from the SEC’s Jay Clayton and the CFCT’s J. Christopher Giancarlo that asserted their agencies’ authority to regulate elements of the crypto market, a major focus of the hearings was to determine which agencies would be responsible for meaningfully enforcing what—a question that requires defining what exactly a cryptocurrency even is. Whats so challenging about bitcoin is it has characteristics of multiple different things […] if its a medium of exchange, then its a currency-like instrument. And yet as we’ve seen a number of means of exchanges have been closed to Bitcoin […] yet it’s still spoken of as perhaps a means of account. In that case it has implications from the [Federal Reserve] and currency. From our point of view, when it’s used as a store of value then it’s very much like an asset, like a commodity. None of what Giancarlo is untrue. It’s also not especially helpful from a regulation standpoint. Both the agencies that sat before Congress this morning have taken aim at businesses in specific incidents: the SEC has halted some initial coin offerings; the CFTC charged My Big Coin and its principals with fraud last month. So far, there’s been little in the way of sweeping enforcement of the market as a whole because no agency seems to agree on whose problem it is. Lack of information might have been precipitated by another challenge brought up by several lawmakers, including Democratic Ohio Senator Sherrod Brown, who pressed for information about the level of these agencies’ technical expertise, and, in the case of the SEC, a hiring freeze. This hearing took place, we should note, just after Bitcoin’s price plunged to around $6,000 before rebounding slightly to just above $7,000.